Joshua is a founder and CEO of Parallel Flight Technologies which is developing new propulsion technology for heavy-lift, long-duration unmanned systems. The target applications are firefighting, public safety, and remote logistics. Before coming to California, he lived in Alaska for 12 years where he designed hybrid power systems for commercial fishing vessels. These systems were designed to survive in the world’s most challenging industrial marine conditions. During this time he was the PI for a combined Federal and State of Alaska grant (Emerging Energy Technology Fund) aimed at exploring hybrid power for commercial marine vessels. Working on this project, he led a small team which developed a novel Variable Speed diesel Generator (VSG) technology and hybrid propulsion drive system. The engineering focus was on enhancing fuel economy, power-density, and modular design. 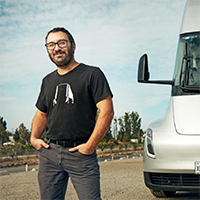 Following this grant project, he led electrical engineering and system architecture for the Tesla Semi Truck Program from the early prototype phase through the Alpha reveal. This work was done over a three-and-a-half-year time frame. In addition to leading electrical engineering for this program, he developed the mechanical systems for power steering and air compression. Joshua graduated in 2001 from Worcester Polytechnic Institute with a BS EE.